Amid the latest flare-up of the illegal-immigration issue nationally, it’s too easy to overlook what is happening on one’s very doorstep. For this state party, the doorstep is Ohio. On June 7, Immigration and Customs Enforcement agents arrested 114 undocumented workers at a gardening center in Castalia; on June 21, 146 undocumented workers were arrested at a meatpacking plant in Salem. By most accounts, those raids were the two largest ever conducted by ICE. Such actions form part of a disturbing pattern along with the policies that have been implemented over the past few months at the Mexican border, where in March, April, and May, over 2,500 children were separated from their parents and kept in “non-criminal” detention centers while their undocumented parents waited in jail for hearings. The systemic causes of the crisis are complex. 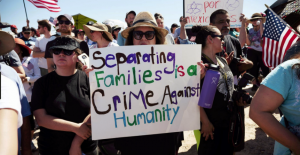 But the two immediate causes are a massive increase in the number of apparently intact families trying to immigrate together, along with a policy of arresting any adult trying to immigrate illegally. Since the current Federal law prohibits holding children in facilities intended for adults, the indiscriminate-arrest policy has forced the Government to house children separately in special facilities that weren’t designed to hold the current numbers. Unsurprisingly, the massive outrage generated by images of small children being held in cages, crying for their parents, caused President Trump to back down. On June 21, he issued on an executive order barring such family separations. Now, children of parents arrested for attempting to cross the border illegally will be detained along with their parents. As the Administration seeks to house such immigrant families in military facilities pending adjudication of their cases, the new executive order can expect court challenges. • A generous policy of asylum for migrants fleeing persecution and violent conflict within their countries of origin, including a call for the United States to fulfill its obligations under international law in regard to the treatment of refugees and those fleeing inhumane conditions. • An end of the use of private for-profit immigrant detention centers as well as the detention of immigrants who do not pose a threat to national security or public safety, especially children and families. With that understood, the main difficulty now presenting itself at the US-Mexican border seems to be one of ascertaining who among the adults trying to immigrate are truly “fleeing persecution and violent conflict” and “do not pose a threat.” But even this question must be addressed within a broader social context. While it may not seem unreasonable to detain undocumented immigrants until it is ascertained that the adults are not a threat and are not just using children as cover, the need for security must be weighed against the human needs that are driving people to the border and the integrity and dignity of the family. Fear of violence in their home countries coupled with the longstanding economic dislocations caused by trade policies promoted by the United States government itself need to form our assessment of why undocumented immigrants are coming to the United States and how we need to treat them once they arrive here. Such an assessment is not, first and foremost, a matter of charity and compassion, but a demand of justice, without which any call to charity is meaningless. The immigration crisis has periodically flared up for decades because both major parties seem more interested in using the issue for political advantage than in seeking a bipartisan solution that balances sovereignty with justice. Congress, the president, and the American people need to ask what role we as American have played in the immigration crisis, and then seek solutions that accord with social equity.